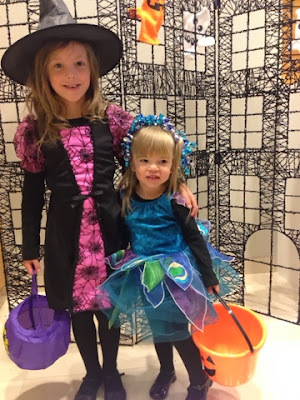 Every year of Ava's life, and Norah's as well, we have attended a great Halloween party at Auntie Jessica's work. She hasn't worked there the last two years, but that hasn't stopped us! We are grateful that they still invite us back! (Or Jessica convinces them to, whatever the case may be...) Sadly, I forgot my real camera. I was having one of those days. In fact, most of the day I was convinced Norah would not be allowed to go. She was in full on fit mode all morning. I vowed that unless she took a nap, I was not taking her. (She refused the first attempt while Ava was at school) She did reluctantly get a quick nap in, so all was forgiven. Except now all we have is blurry pictures. I'm blaming it on her, she threw off my day. : ) Fortunately we will have three days in total for photos in these costumes so it's not too tragic. Now bring on the candy!! On Saturday we attended little miss Georgia's birthday celebration. This little sweetie is about to turn two. My girls had a wonderful time playing with all the kids & I enjoyed talking with all the adults. I adore their whole family. I love this picture, Happy Birthday sweet little Georgia!! We got invited to a little Halloween thing Chris & D'Auna's church put on Saturday. It was called Trunk or Treat, they filled a parking lot full of cars with their trunks open & decorated for the kids to trick-or-treat to. So fun! Here's our cute little witch & peacock. Love these guys at pirates! It was funny at some point in the evening I saw Alayah crying and I told D'Auna, "some woman is holding Alayah, she is crying." D'Auna looks over and says "That's Chris" hahahaha Colton, the ninja! Our little peacock wasn't sure about this scene right away. She was in a mood. Until people started giving her candy... The fortune teller. Walking the plank through shark infested waters. A trunk full of candy, yay! Back to the Pumpkin Patch. I LOVE this one. And this. Ava found lots of friends to play with there, hay fight!! Crazy for Fall & Family.